New York Times bestselling author Ed Klein has just published his fourth book about the Clintons since 2005, Guilty as Sin. Klein had told how Bill Clinton enjoyed foot rubs, massages and romps in his presidential library with female interns and has described new details about Hillary’s medical crises. Guilty as Sin is available in bookstores and for order from Amazon. 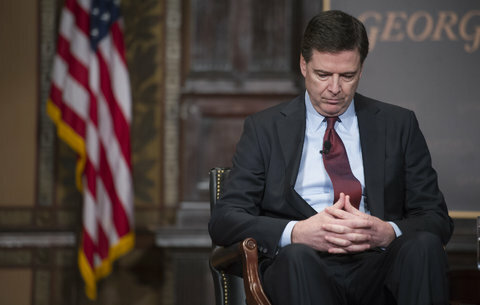 James Comey’s decision to revive the investigation of Hillary Clinton’s email server and her handling of classified material came after he could no longer resist mounting pressure by mutinous agents in the FBI, including some of his top deputies, according to a source close to the embattled FBI director. ‘He’s been ignoring the resignation letters in the hope that he could find a way of remedying the situation,’ said the source. ‘When new emails that appeared to be related to Hillary’s personal email server turned up in a computer used [her close aide] Huma Abedin and [Abedin’s disgraced husband,] Anthony Weiner, Comey jumped at the excuse to reopen the investigation. ‘The people he trusts the most have been the angriest at him,’ the source continued. ‘And that includes his wife, Pat. She kept urging him to admit that he had been wrong when he refused to press charges against the former secretary of state. ‘He talks about the damage that he’s done to himself and the institution [of the FBI], and how he’s been shunned by the men and women who he admires and work for him. It’s taken a tremendous toll on him. But Comey’s decision to reopen the case was more than an effort to heal the wound he inflicted on the FBI. He was also worried that after the presidential election, Republicans in Congress would mount a probe of how he had granted Hillary political favoritism. His announcement about the revived investigation, which came just 11 days before the presidential election, was greeted with shock and dismay by Attorney General Loretta Lynch and the prosecutors at the Justice Department. ‘Jim told me that Lynch and Obama are furious with him,’ the source said.